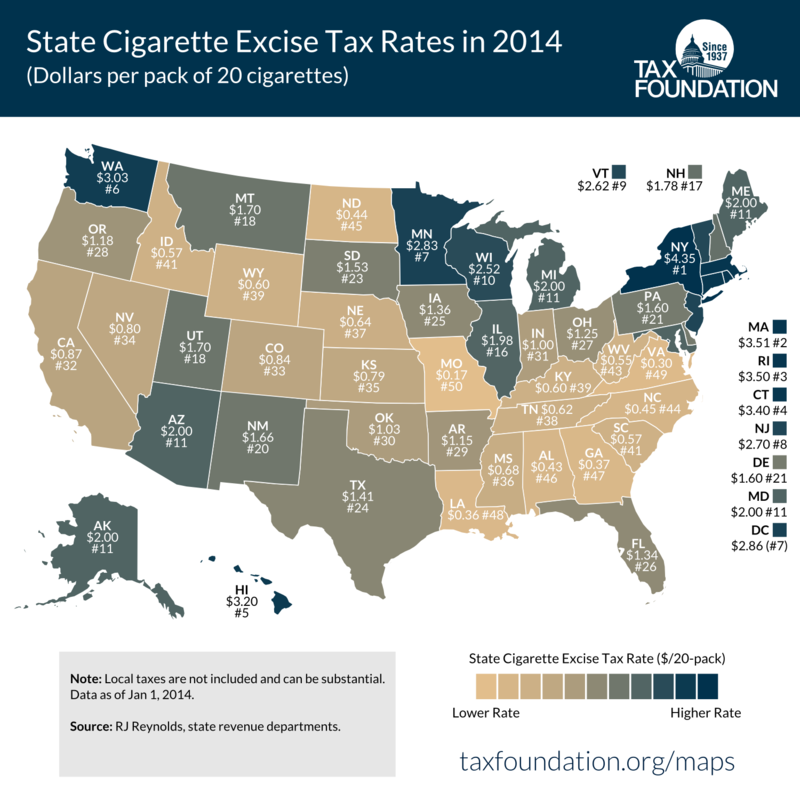 For this week's tax map, we take a look at cigarette tax rates across the country, which vary widely from state to state and are levied on top of a federal rate of $1.0066 per 20-pack of cigarettes. Cigarettes are taxed the highest in New York, at $4.35 per pack. New England rounds out the remaining top four, with Massachusetts charging $3.51 per pack, followed by Rhode Island ($3.50) and Connecticut ($3.40). On the other end of the spectrum, Missouri levies the lowest tax on cigarettes at just 17 cents per pack – trailed closely by Virginia ($0.30), Louisiana ($0.36), and Georgia ($0.37). Not shown here are local cigarette taxes, which can be substantial. In Chicago, Illinois, the combined state, county, and municipal taxes total to $6.16, while in New York City, smokers pay $5.85 per pack. States didn’t start taxing tobacco until the 1920’s, but by 1969, each state and the District of Columbia had followed suit. And although cigarettes are already one of the most heavily taxed consumer goods in the U.S., many states continue to target smokers with increased rates. In fact, effective this month, Vermont’s cigarette tax jumps up 13 cents to $2.75 a pack – sliding the Green Mountain State ahead of New Jersey into 8th in the ranking. (Note: the map, which is constructed using data as of January 1, 2014, published in Facts & Figures 2014: How Does Your State Compare?, does not reflect this change). Many states use collections from tobacco taxes to fund their public school systems, which raises important questions about distorted incentives and the stability of revenue for education. Moreover, evidence shows that wide differentials in cigarette taxes across states have opened up a black market for smuggling, with criminals obtaining cigarettes in low-tax states and selling them in high-tax states. Further, taxes on cigarettes disproportionately affect low-income residents. Read more about cigarette taxes here.